This project is an APRS iGate for ARISS program's digipeater aboard the International Space Station. I have a 2m FM radio tuned to 145.825 MHz. As the ISS passes over my location, the radio passes the received signal from the ISS to a Terminal Node Controller (TNC) that resides atop the Raspberry Pi. The TNC decodes the audio tones and creates data packets the Raspberry Pi can receive, process and pass along to the APRS Internet Service (APRS-IS) network. By documenting the setup and allowing others to more easily create iGates for the ISS digipeater, this ensures coast-to-coast and around-the-world coverage for the ISS APRS-listening network. You do not have to have a satellite tracking system to receive APRS packets from the ISS. If you have an antenna and the resources, consider building an ISS iGate. I created my first Raspberry Pi iGate in the Spring of 2014. 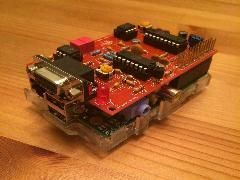 I hope the wider ham community enjoys my iGate and inspires others to build their own. I have also built a Raspberry Pi WebSDR and I'm working on a 20m WebSDR receiver as well as an amateur radio satellite tracker. Click here for a list of my other amateur radio related Raspberry Pi projects. Note: Before we begin, note that many of the files you're editing will need to be edited through sudo. Use your favorite editor (vi, nano, pico) like this: sudo vi filename. The first step after getting a basic Raspberry Pi setup is to disable SPI, I2C and Serial from raspi-config. We do not need any of these connections if we're only wanting to setup an iGate with the TNCPi. The next file to edit is /etc/inittab. Because this file is in /etc, we will need to use sudo to make changes. We need to comment out the line below. To comment out the line, simply put a # in front of the line. With the console available for our TNCPi, we now need to install aprx if you have not done so already. We first need to download the software from the project page, here. I've found the easiest way to get it on the pi is to use wget. To post content on the APRS-IS, we need to generate a passcode. This is done from this page or any of the dozens of others available on the web. Write down the passcode the webpage gives you, we'll use that in the next step. Now with the APRX software installed and our APRS-IS key created, we need to edit the aprx.conf file in /etc. Again, this will require sudo to make changes. Much of the configuration file is documented, but it may be helpful to review a "simplied" version without as much visual clutter. The APRX manual also has a few examples as well. Below is a snapshot of my aprx.conf file. My shack is detached from my house, in the Fall of 2015 I ran a (relatively) short run of fiber to the shack in a buried conduit to provide solid network capability. In the shack I have a multi-port switch for my computer and other Raspberry Pi projects I have running. In the past I have use wireless so if you want to create a set-it-and-forget-it type setup in the back of your garage, storage shed, shack or attic, wireless is an option.